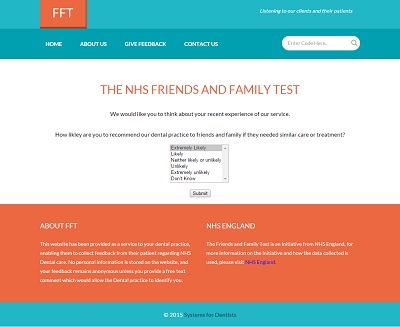 As of April 2015, the NHS has expanded its Friends and Family Test (FFT) program to include visits to dental practices. Systems For Dentists has implemented a very simple automated system for either emailing or sending the patient a request at the end of their course of treatment. The message contains a unique code that directs the patient to the Friends and Family Test web site. The patient is then asked the question and offered the option of leaving any other feedback. It's as simple as that. The results are automatically uploaded to the practice to enable reporting. Please visit the The NHS Friends and Family website for more information.